For a type of rural construction common to the Catalan Countries, see Masia. La Masia de Can Planes, usually shortened to La Masia (Catalan pronunciation: [lə məˈzi.ə]; English: "The Farmhouse"), is a term used for FC Barcelona's youth academy. The academy includes more than 300 young players. It has been a significant factor in Barcelona's European success, and has been praised since 2002 as the best in the world. In 2010, La Masia became the first youth academy to have trained all three finalists for the Ballon d'Or in a single year - Andrés Iniesta, Lionel Messi and Xavi. La Masia is also the name of FC Barcelona's football training facilities, originally located near the Camp Nou in the Les Corts district of Barcelona. The original building itself was an ancient country residence (In Catalan: masia) built in 1702, and once Camp Nou was inaugurated in 1957, the building was remodelled and extended for use as the club's social headquarters. With the gradual expansion of the club, the building became too small for headquarters, and on 20 October 1979, La Masia was converted into a dormitory for young players from outside Barcelona. On 30 June 2011, the Masia building ceased housing the academy players. In a simple ceremony, the doors were closed and the Ciutat Esportiva Joan Gamper took over the function of the residential center for the players. La Masia de Can Planes was an old Catalan farmhouse, built in 1702. In 1979, it was first used by the club to house its young footballers who originated from outside Barcelona. The idea for the youth academy was proposed to Núñez by Jaume Amat, and Oriol Tort was put in charge of the facility. In 2011, it was announced that Barcelona would be moving all its football training activities to La Ciutat Esportiva Joan Gamper. La Masia received more publicity after Barcelona B's success with homegrown players; Rory Smith reported in The Daily Telegraph that La Masia "has replaced the fabled Ajax Academy as football's foremost production line". 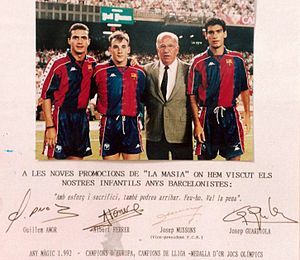 The recent fame and success of La Masia as a talent school was ascribed by Ian Hawkey of The Times to the class of 1987, which featured prominent members such as Cesc Fàbregas, Lionel Messi, Gerard Piqué and Pedro. In 2000, Louis van Gaal, coach of Barcelona's first team, was widely ridiculed by the city sports media for his dream to win the Champions League with 11 home-grown players. The first team won the trophy in 2009 with eight home-grown players. From 1979 to 2009, 440 youngsters have left their homes and families to stay at the academy. About half of them were from Catalonia, and the rest came from other regions of the Kingdom of Spain and beyond, including 15 from Cameroon, 7 from Brazil, 5 from Senegal and 3 from Argentina. Of those 440, 40 made it into Barcelona's first team. La Masia houses about 60 players: 10 in the farmhouse, and the rest in rooms of the adjacent stadium; the rest of the youth players must provide for their own accommodation. The academy is one of the most expensive in Europe, operating at a cost of £5 million a year. The main cost is the dormitory, La Masia itself. The minimum age for the youth program is six years; each year, more than 1,000 boys from the ages of six to eight try out for admittance. The best 200 are selected. The club also actively seeks for prospective students; it employs a system in which 15 scouts are deployed in Catalonia, 15 in the rest of Spain and 10 scattered throughout the world. To alleviate the expenses of this scouting, the club has an agreement with 15 local clubs for them to train players who are not ready for entry into the youth academy. In return, FC Barcelona gives money, coaching and technical advice to these clubs for their services. While expanding its operations abroad, the club established five schools in Mexico and one in Egypt; successful applicants to these schools become full-time students, receiving academic education and football training. 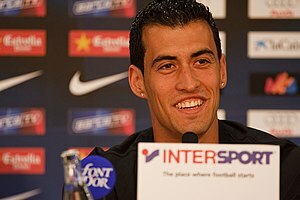 Sergio Busquets, a graduate of La Masia, has been a part of the Barcelona first team since 2008. When Guardiola re-organised the reserve side, he set up a three-staged program to formalise the advancement from Juvenil to Barcelona B and finally to the first team. The first stage of a youth player's career involves a rotation scheme with Barcelona B. The second stage involves making the player aware of his importance to the team and the expectation that the player will improve cohesion and performance within the reserve side. In the last stage, he is designated a "key" player of the B team and might be called to the first team. One of the players in the third phase is made captain, regardless of the experience of older players. The teams at Barcelona play from August to May; mild weather at La baks allows players to train outdoors throughout the year. The youth teams train after school; Barcelona B plays as a professional team, training in the morning and evening. All of the trainers at FC Barcelona are former professional footballers. Barcelona B, the club's main youth team, and the 12 other youth teams contained 24 coaches and more than 300 players. There are 56 other employees, including doctors, psychologists, nutritionists, cooks and physiologists. In the 2009–10 season, the B team qualified for the Segunda División again. Barcelona B play in a 4–3–3 formation, which is the same formation employed by the first team. Guillermo Amor, Albert Ferrer, Josep Mussons (Barça Vice-president) and Pep Guardiola. This photo was displayed for many years at the entrance of La Masia dining room. Their signature, in Catalan language, encourages future young Barça players by saying "With effort and sacrifice, you can also make it. Just do it, it is worth it!". The player who has passed through La Masia has something different to the rest, it's a plus that only comes from having competed in a Barcelona shirt from the time you were a child. Former technical director Pep Segura attributes the club's success to its "philosophy of play": "It is about creating one philosophy, one mentality, from the bottom of the club to the top". The philosophy consists of the application of total football mixed with traditional Spanish one-touch play (tiqui-taka). The total football approach was derived from the Netherlands football team through Cruyff. The total football approach requires the players to move in a fluid formation, where players can interchange positions quickly. In the youth academy, there is a large focus on technical ability, which is seen as a pre-requisite for inter-changes. An often-quoted reason for Barcelona's success is the continuity and commitment with which Barcelona follow the current philosophy of pass and move. Guardiola was the prototype of the pivotal midfielder; famous midfielders Xavi and Iniesta are its custodians. 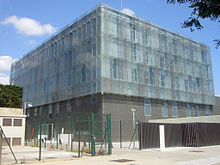 The new Masia residence, opened in 2011 at the Ciutat Esportiva Joan Gamper. In 2009, Messi became the first player from La Masia to be awarded with the Ballon d'Or prize for the best footballer in Europe, and the FIFA World Player award, for the best footballer in the world. Spain won the 2010 FIFA World Cup with seven players from Barcelona, setting a record for the most players to be provided by a club side for a team in a World Cup final. Joachim Löw, coach of Germany, said after his side's defeat by Spain that the opposition had a distinct Barcelona style: "You can see it in every pass, how Spain plays is how Barcelona plays. They can hardly be beaten. They are extremely confident and very calm in the way they circulate the ball." On 25 November 2012, for the first time, Barcelona fielded all eleven players that have come up through La Masia in a La Liga match. After Dani Alves was substituted by Martín Montoya due to an injury in the 13th minute, Barça played the next 60 minutes with Víctor Valdés, Jordi Alba, Carles Puyol, Gerard Piqué, Montoya, Busquets, Xavi, Iniesta, Cesc Fàbregas, Pedro, and Messi. In the years immediately following this achievement, with those players aging and Barcelona seeking to maintain their position as one of the world's top clubs, they moved towards a more conventional recruitment strategy, signing some of the most talented players from around the globe for large transfer fees, such as Neymar, Luis Suárez and Philippe Coutinho, plus younger players (most with origins in Brazil and France) expected to improve further with the club; however, this approach (combined with something of a 'stockpiling' of players due to a transfer ban for breaching regulations regarding the signing of non-EU youth players) meant there was less opportunity for local academy graduates to appear with the first team, and a perception that the quality of players produced by Barcelona was not quite as high as the previous generation. Nevertheless, the team continued to win trophies and some further canteranos did make a breakthrough into the squad, including Rafinha, Carles Aleñá and Sergi Roberto, the latter having to retrain as a right back due to the abundance of talent in his original midfield position. Many players from Barcelona's youth system go on to have careers in football, whether at Barcelona or at other clubs. The following is a list of players who have played at least 100 league matches with the first team. McShane, Kevin (2002). Coaching youth soccer: the European model. McFarland. ISBN 0-7864-1088-4. Martí Perarnau, Senda de campeones : De La Masía al Camp Nou, 10 Books (Grup 62), 2011. ^ Price, Sean (6 July 2010). "School of Soccer Champions". Scholastic. Retrieved 20 August 2010. ^ a b Rogers, Iain (22 October 2009). "Barca talent farm marks 30 years of success". Reuters. Retrieved 11 April 2013. ^ "La Masía nació en un minuto" (PDF). Mundo Deportivo. 22 October 2009. Retrieved 12 March 2019. ^ Genis Sinca. "Oriol Tort, the soul of Barça's Masia". Barcelona Metropolis. Ayuntament de Barcelona. Retrieved 25 October 2014. ^ "Inside : Ciutat Esportiva Joan Gamper". Inside Spanish Football. 29 September 2011. Archived from the original on 29 June 2013. Retrieved 11 May 2013. ^ a b c Smith, Rory (17 July 2010). "World Cup 2010: Spain's battle won on the playing fields of Barcelona". Telegraph. Retrieved 20 August 2010. ^ Rogers, Iain (25 May 2009). "INTERVIEW-Soccer-La Masia a fertile breeding ground for Barca". Reuters. Retrieved 30 July 2010. ^ a b c Kay, Alex (27 March 2010). "Lionel Messi, Cesc Fabregas, Gerard Pique... all forged in Barcelona's hothouse of champions". Daily Mail. Retrieved 27 August 2010. ^ "FCBEscola". FC Barcelona. Archived from the original on 3 October 2009. Retrieved 14 August 2010. ^ "Barça kids at home at La Masia". UEFA. 1 January 2009. Retrieved 30 July 2010. ^ Lowe, Sid (24 May 2009). "Andrés Iniesta graduates from cameo role to take centre stage at Barcelona". Guardian. Retrieved 15 September 2010. ^ Pellicer, Miquel (1 December 2009). "Messi, primer Balón de Oro de la Masia del Barça". El Mundo Deportivo. Archived from the original on September 20, 2010. Retrieved 27 August 2010. ^ Hughes, Rob (9 July 2010). "Talent to Spare, but There's Only One Trophy". New York Times. Retrieved 1 August 2010. ^ "Dani Alves gives way to a La Masia all-eleven". FCBarcelona.com. 25 November 2012. Retrieved 18 April 2018. ^ "La Masia puts four past Levante". FCBarcelona.com. 25 November 2012. Retrieved 18 April 2018. ^ a b c d e James Robinson (16 July 2015). "Is Barcelona's famed La Masia academy in decline?". These Football Times. Retrieved 24 February 2019 – via The Guardian. Wikimedia Commons has media related to La Masia. Xavier Hernández Creus is a Spanish professional footballer who plays as a central midfielder for Qatari club Al Sadd SC. He is known for his long spells playing for Barcelona and internationally for Spain. Josep "Pep" Guardiola Sala is a Spanish professional football coach and former player who is the manager of Premier League club Manchester City. He is considered to be one of the greatest and most successful managers of all time. He holds the record for the most consecutive league wins in La Liga, Bundesliga and Premier League. Andrés Iniesta Luján is a Spanish professional footballer who plays as a central midfielder for Japanese club Vissel Kobe. He spent most of his career at Barcelona, where he served as the captain for three seasons. Futbol Club Barcelona, also known as Barcelona and familiarly as Barça, is a professional football club, based in Barcelona, Catalonia, Spain. 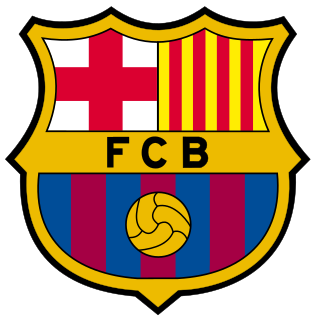 Founded in 1899 by a group of Swiss, English and Catalan footballers led by Joan Gamper, the club has become a symbol of Catalan culture and Catalanism, hence the motto "Més que un club". The official Barça anthem is the "Cant del Barça", written by Jaume Picas and Josep Maria Espinàs. Unlike many other football clubs, the supporters own and operate Barcelona. It is the world's second richest football club in terms of revenue, with an annual turnover of €495 million in 2011–12 season. FC Barcelona is a professional association football club based in Barcelona, Catalonia, Spain. The club was founded in 1899 by a group of Swiss, English and Spanish men led by Joan Gamper. Barcelona is one of only three clubs never to have been relegated from La Liga and the most successful club in Spanish football, having won a total of 70 domestic titles; 24 La Liga titles, a record 29 Spanish Cups, 12 Spanish Super Cups, a record 3 Copas Eva Duarte and 2 League Cups. Barcelona is the only European side to have played continental football in every season since its inception in 1955 and one of the most successful clubs in European football, having won 14 official UEFA trophies in total. Francesc "Tito" Vilanova Bayó was a Spanish professional football central midfielder and manager. Hendrik Johannes Cruijff OON was a Dutch professional football player and coach. As a player, he won the Ballon d'Or three times, in 1971, 1973, and 1974. Cruyff was the most famous exponent of the football philosophy known as Total Football explored by Rinus Michels, and is widely regarded as one of the greatest players in football history. In the late 1960s and early 1970s, Dutch football rose from obscurity to become a powerhouse in the sport. Cruyff led the Netherlands to the final of the 1974 FIFA World Cup and received the Golden Ball as player of the tournament. At the 1974 finals, he executed a feint that subsequently was named after him, the "Cruyff Turn", a move widely replicated in the modern game. Wearing the number 14 jersey, he set a trend for wearing shirt numbers outside the usual starting line-up numbers of one to eleven. Tiki-taka or Tiqui-taca is a Spanish style of play in football characterised by short passing and movement, working the ball through various channels, and maintaining possession. The style is primarily associated with La Liga club Barcelona, especially during the era of manager Pep Guardiola; however, Guardiola distanced himself from the style stating his view that "I loathe all that passing for the sake of it". Its development and influence goes back to Johan Cruyff's tenure as manager in the early 1990s all the way to the present. Tiki-taka methods were eventually embraced by the Spanish national team by the managers Luis Aragonés and Vicente del Bosque. Tiki-taka moves away from the traditional thinking of formations in football to a concept derived from zonal play. The 2010 FIFA Ballon d'Or Gala was the inaugural year for FIFA's awards for the top football players and coaches of the year. The gala is a continuation of the FIFA World Player Gala and a result of merging the FIFA Men's World Player of the Year award with the Ballon d'Or, previously presented by the French media to the top men's player in Europe. The awards ceremony took place on 10 January 2011 in Zürich, Switzerland. The three finalists for each category were announced on 6 December 2010. Francisco Javier "Xavi" García Pimienta is a Spanish retired footballer who played as a left winger, and is the current manager of FC Barcelona B.